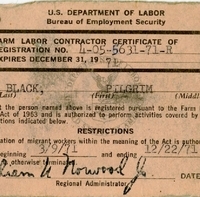 Farm labor contractor certificate for Pilgrim Black (1905-2002) issued by William N. Norwood, Jr. of the U.S. Department of Labor Bureau of Employment Security on March 9, 1971. The certificate authorized Pilgrim Black for migrant labor. At the time that the certificate was issue, Pilgrim resided at 1101 East Tenth Street in Sanford, Florida. His date of birth was listed as April 2, 1907, but he was actually born in 1905. The certificate also identified Pilgrim as a 5'9" person weighing 155 pounds with black hair and brown eyes. Original certificate by U.S. Department of Labor Bureau of Employment Security, 1971: Private Collection of Patricia Ann Black. Digital reproduction of original certificate by the U.S. Department of Labor Bureau of Employment Security, 1971. Originally created by the U.S. Department of Labor Bureau of Employment Security and owned by Pilgrim Black. I certify that the person named above is registered pursuant to the Farm Labor Cot[?] Registration Act of 1963 and is authorized to perform activities covered by the Act, s[?] to the restrictions indicated below. The transportation of migrant workers within the meaning of the Act is authorized only during[?] the period beginning 3/9/71 and ending 12/22/71, unless [?] authorization is otherwise terminated. Permanent Home Address 1101 E. 10th St. Certificate is based on the Farm Lanor Contractor Registration Act of 1963 and regulated[?] [?] thereunder, and on my application for registraion. It may be revoked or suspended or its renewal denied, for noncompliance with the Act or regulations, including application requirements for transporting migrant workers. Such noncompliance may constitute a federal offense. U.S. Department of Labor Bureau of Employment Security. “U.S. Department of Labor Bureau of Employment Secruity Farm Labor Contractor Certificate of Registration No. 4-05-5631-71-R.” RICHES of Central Florida accessed April 20, 2019, https://richesmi.cah.ucf.edu/omeka/items/show/2662.